I really admire how young these two food-growers are! People in my city are becoming more and more interested in learning how to grow produce in their yards, or are seeking out food that has been grown organically within the city. It is so wonderful watching this growth and enthusiasm as it takes off! For 24-year-old Philippe Carroll and 23-year-old Samantha Arney, growing a large urban garden next to their home on their double lot in the Wells Street Corridor near downtown Fort Wayne is more than just a way to make extra money, it's a way of life. It's a way of feeling connected to the Earth and to their community. Carroll and Arney are the owners of Young Urban Homesteaders and part of a growing trend of the farm-to-fork food movement and the grow-food-not-lawns agricultural movement. Status, titles and trends are not important to this young couple, however. What is important is building a sustainable ecosystem and selling the best product to Fort Wayne market shoppers. The Homesteaders offer everything from chard and kale to okra and kahlrabi. They also sell handmade herbal teas with herbs from the garden. While prices vary for each different market item, the Homesteaders also offer a unique pricing system: prices are a suggested donation. “We want to make it available to anyone,” Carroll said. “If you are used to paying for more your food at certian places then you are more than welcome to pay more and pay what you are used to. If you are used to paying less you are welcome to pay less to have access to food. But we also need to stay afloat,” he said. When they first moved to their home in November, they noticed two apple trees and a peach tree. Carroll said they began to build their farm around the existing fruit trees. In their garden, everything is connected and strategically placed. The sunflowers are planted above the lettuce to maximize space and protect each other from the elements to provide the ideal growing condition. The young two farmers have a wealth of knowledge. From planting to ways to reuse waste, most everything is considered. The Homesteaders also develop their own black gold fertilizer, creating their own compost and even cultivating their own worms. Everything that comes out of the soil or the beds goes back into it one way or another. Arney said while they have only been selling for a few months, so far they are getting a lot of support from the community. “Just for people to be able to see that we can grow food in a small place and actually get it to people - it's inspiring to people. It's a way to do what we love and make a living off of it. It's also a way to show other people that this is possible. We have neighborhood kids that started coming around and they have taken to it and they love it,” Arney said. Georgina Balestra, Carroll's grandmother, grew up on a farm in Cuba. She said she is proud of what he is doing. She said she was wondering about how much he could really grow in such a small area, but she said she is extremely impressed. "He has always been interested in nature. I'm learning a lot from him," she said. "It's the satisfaction of not only doing something for yourself, but doing something for others." Carroll said he is on a mission to live with less impact in a high density environment. “When it came down to it I was thinking, 'What do I want to do with my day? What do I want to do with my daily energy?' There's something I really enjoy about putting my daily energy - I get my exercise - into growing food which then sustains me and it sustains my community,” Carroll said. The Young Urban Homesteaders set up a stand at the Fort Wayne Farmers Market from 10 a.m. to 2 p.m. on Wednesdays at One Summit Square. They also appear at the West Main Street Farmers Market from 3 to 8 p.m. on Friday's at 1938 West Main St. They accept credit and debit card. 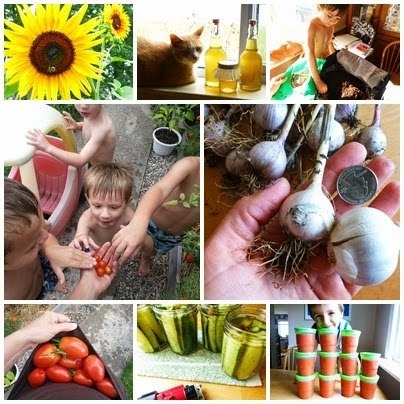 For more information on the Young Urban Homesteaders, the Fort Wayne Farmer's Market and the Historic West Main Street Farmers Market visit their Facebook page. When you are collecting tomatoes every day, they start taking up a lot of counter space. As they wait for their end (eaten fresh, juice dripping down your chin? sauced? roasted? ), set them out on a layer of newspaper. Make sure each tomato has its own little space (try not to stack them), and the newspaper will help with airflow so the tomatoes continue to ripen, not rot. If you have a silly tomato with a nose, by all means, dress it up and hide it among the others. The reaction from passersby is awesome. These tomatoes are waiting to become sauce! Stay tuned! Not too long ago I mentioned this straw bale that sits next to the garden, and that it was destined for a special purpose. Well, it has met it's destiny—as a self-contained planter! I only recently learned that you can directly grow plants in straw bales, with just a small layer of soil on top. The straw that begins to decay inside the bale becomes a great environment for the roots of your plants. Some people have whole gardens made of straw bales. If you take a minute and google for images of 'straw bale gardens', you'll be totally amazed . This idea is especially nice if you have access to cheap or free straw. We planted peas in mid July. Is that a bit late to plant anything? Maybe. Don't forget, I'm a newbie who likes to experiment. Perhaps we will get a fall harvest of delicious peas—they do like cooler weather. Using some leftover bagged potting soil, we made a nice little bed, and in went the peas. The kids LOVED doing this. But then, what kid doesn't get a thrill when you tell them to grab some dirt with their bare hands?! The pictures below tell the story. About a week after the initial seed sowing, we replanted in the areas where nothing came up, and pushed bamboo stakes down into the straw (so easy) for supports. If needed, we can thread some thick string around the stakes and give these peas a happy growing space. Once all the peas have been harvested and we head into winter, we can put the spent plants, soil, and straw, all together, in our compost! We may have been mashing that dirt down a little too hard! Oh yeah. That's what I like to see.. The straw, newly planted, sitting nicely by the garden! Keeping the peas misted and happy!